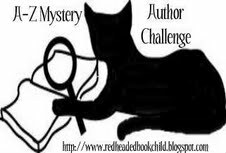 red headed book child: CHALLENGE UPDATE and GIVEAWAY! I have changed a few things regarding my first Challenge. I received some good tips from fellow bloggers and I decided to go with it. If you have already signed up, please leave another comment below. Thanks! I will be choosing the A-I portion of the alphabet to start! If I do well, I will continue on! Some of the authors I am interested in are Nancy Atherton, Lawrence Block, Benjamin Black, Lee Child, Diane Mott Davidson, just to name few. I am shooting for authors I have never read before. ! Thank you to Touchstone Books (Simon and Schuster) for sending me 2 copies of this new mystery to give away to one of my readers. this book would be right up your alley. 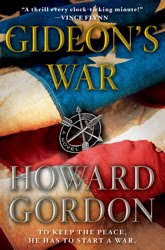 Howard Gordon—the longtime executive producer of the hit TV series 24—makes his fiction debut with a tale of political intrigue and international terrorism. Gideon Davis has just 48 hours to bring his rogue agent brother in—before a twisted global conspiracy turns deadly. GIDEON DAVIS, whose behind-the-scenes negotiating skills have earned him the role of peacemaker in conflicts around the globe, knows more about hush-hush discussions in Capitol corridors than he does about hand-to-hand combat. But his more practical, tactical skills come into play when he's called on by family friend and government bigwig Earl Parker to chaperone a rogue agent from Southeast Asia to D.C. The agent, Tillman Davis, has promised to turn himself in— but only to his brother, Gideon. Although the two brothers have been estranged for years, Gideon cannot fathom how his brother could have turned into so ruthless a man. But when the plan for Tillman's surrender goes awry and Earl Parker is taken hostage, Gideon is forced to embrace his dark side in order to evade hostile locals in war-torn Mohan to make his way to the Obelisk—the multimillion-dollar, state-of-the-art oil rig that has been seized by terrorists led by Tillman himself. It is with the help of oil rig manager Kate Murphy that Gideon launches an unlikely one-man rescue. might do the challenge but enter me for the book. I'm going to search my TBRs for possible "candidates" before deciding which part of the alphabet. I'm going to try it. I like mysteries. I also like the way you have the authors' names split up too. I haven't chosen my letters yet. I think it's the one with the g or l. Maybe this is the same category. Need another look-see. I have your button too, your regular button. Will come back for your challenge button. Thanks for allowing me to join. Sounds like fun. I'll be doing J-P. Yes, sign me up for the giveaway. I'll probably do the challenge as well, just don't have anywhere to post it. I'll give it a go. Sounds fun! Ooooh, I'd love to do this challenge. I've got to do some research and scrape together time for an intro post. I'll link to it as soon as I get it together. In the meantime, please add me to the list! I hope it's not too late to sign up or to enter for the book! I'm in! Finally posting all of my reading challenges for the year. Michelle, have you decided how you are going to do your review link ups? I'd like to join in on the challenge, but would like to know if crossovers with other challenges count or if they have to be all new books. Congrats again on your first challenge! Nixon, Joan Lowery Who Are YOu?